Bennett Brinson Gamel: Fighting Cystic Fibrosis: Today has been very slow-going. Today has been fairly slowgoing for Bennett with regard to improvement. Bennett is either awake and hurting or asleep. He cannot move without it hurting. Even accidentally knocking the bed will cause him to hurt. He has not eaten or drunk anything all day. His throat hurts from being intubated. His abdomen from his belly button down is in pain. He gets Hycet every 6 hours. And, he has access to a morphine drip which puts him to sleep fairly quickly. During the morning, they kept pushing Bennett to eat Popsicles, ice cream, jello, etc. But by lunch time, they had put him on NPO (nothing by mouth). The Pediatric Surgeon noticed his abdomen was distended and ordered an X-ray. I am waiting to hear back more on what they are concerned about. I pushed quite firmly today to see a Pulmonologist for a consult. 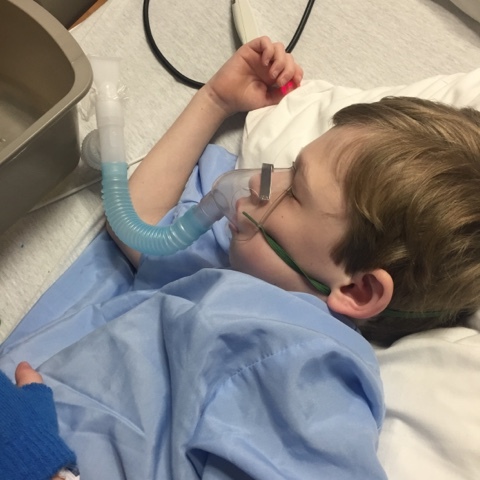 Bennett gets his CF care at Children's Medical Center in Dallas so Bennett's CF team is not able to monitor his lungs right now. Surgeries and anesthesia put Cystic Fibrosis lungs at risk for infection. So, I was adamant that I need to see a Pulmonologist by days end. Thankfully they just stopped by. The Pulmonologist agreed we can't do a Vest treatment right now due to his abdomen pain so Bennett's lungs are forced to stay lay dormant. Dormant CF lungs are never good. We need to get the mucus in his lungs moving. But right now, there isn't much we can do. I asked if we could up his breathing treatments and possibly look at another option for percussion therapy. The team is going to see if the hospital has access to a Hill-Rom MetaNeb System or we will get our Aerobika from home. Bennett's oxygen levels dropped from 98% last night to 87% this evening. We think it's due to the morphine but we have added supplemental oxygen when needed. I am praying we will get out of this surgery without a lung infection. We are in an isolation room on "reverse isolation." This is the Cystic Fibrosis Foundation protocol for hospitalized Cystic Fibrosis patients. This means that we are in a room with double doors where every person who enters our room must wear a gown, gloves and a mask. This used to be scary - to have these strangers in our room dressed in protective gear. But now it's more scary to see hospital workers not wearing this protective covering. The gloves, gown and masks are not to protect them but to protect Bennett. 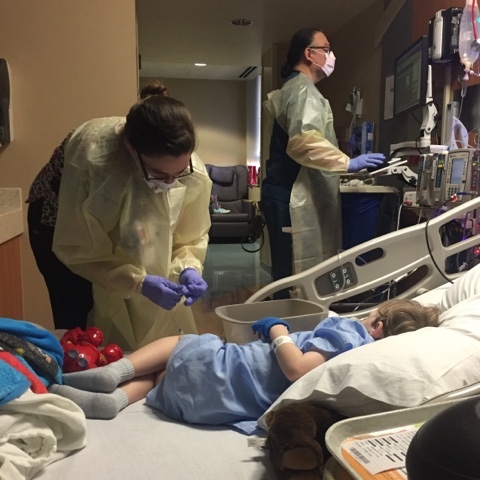 We cannot leave in our room and walk about the floor - a rule we abide by to minimize Bennett from the possibility of being infected by a multi-drug resistant bacteria. My friend Kristin stopped by this morning for a visit as she was already volunteering in the hospital. A decent lunch and a visit with a friend the a highlight of my day. Another surprise Bennett received today was a bag with four balloons that inside held a giant bear (who Bennett ended up named him "Lovey Bear") and tons of little things Bennett can do when he feels better. My favorite part of the gift was a smaller bag of candy inside the bigger bag that was labeled: "This is for when you break free!" The card about made me cry. 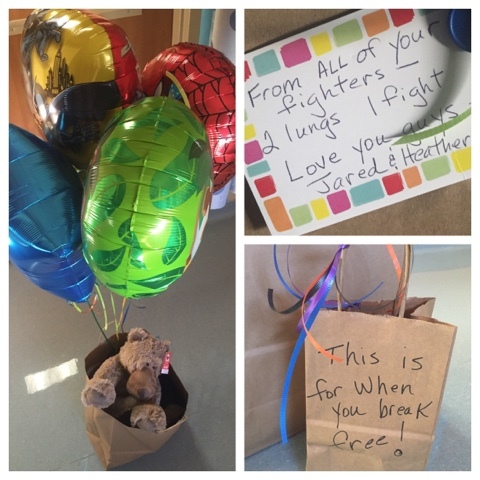 It read, "From all of your fighters, 2 lungs, 1 fight. Love you guys, Jarrod and Heather." Brian and I yet to have the opportunity to meet Jarrod and Heather in person yet but we have the greatest admiration for them as they have two little boys with CF. As Jarrod alluded, we are all in this together. I was really touched to be shown kindness by others who are going through some of the same challenges we are. 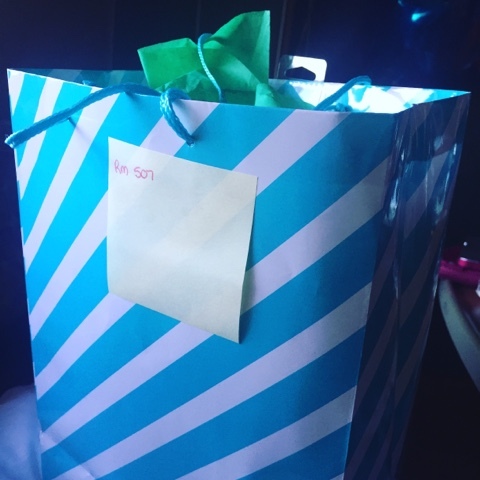 Unfortunately, Bennett really wasn't able to enjoy his gifts today because he's just feeling so badly. Hopefully he can enjoy them soon. I miss Bennett.